I shouldn’t say this is the final Journeys in the Disney Vault till November as you’ll be getting The Adventures of Ichabod and Mr. Toad early in October. Let’s say then this is the last one, in order, till November. As a kid I didn’t like Bambi, and not because of the whole Bambi’s mom thing, which never bothered me unlike other kids I knew, I just didn’t like it past Bambi and his friends as kids. In rewatching the film I actually discovered I’ve never seen the last forty or so minutes! Again, there’s just something about Bambi and his friends as children that’s better than them as adults. Bambi is a young deer forced to grow up quickly after his mother is viciously slaughtered at the hands of man (yes man, the devil of planet Earth). As I mentioned in my Dumbo review, Disney was struggling financially during the 1940s. Fantasia and Pinocchio were failures at the box office and while Dumbo revived them for a bit, Bambi and WWII kept them in the red. In fact Bambi would be the last full-length film till Cinderella in 1950, thus why the next six films in the animated canon were shorts compiled into full-length features. I didn’t mention this with Pinocchio but Bambi is also well-known for deviating heavily from its original source material, a 1923 Austrian novel called Bambi: A Life in the Woods. 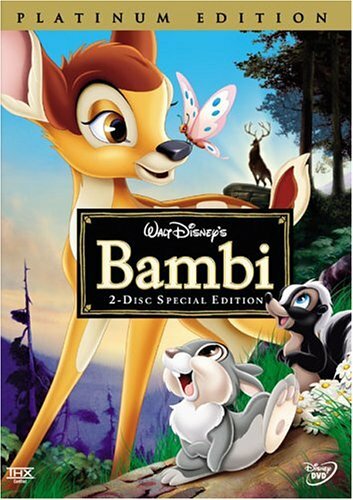 The book looks at Bambi’s life from infancy to adulthood with additional characters, life lessons, and a stronger relationship with his father (although I’m assuming that was explored in Bambi 2…it pains me that a sequel to this is out there). While I kid with that premise above there’s really nothing much aside from that incident to make this film memorable. I’d consider Bambi to be a series of vignettes as opposed to one plot line, other than the fact that we char Bambi’s life from infancy (if you can call it that) to adulthood. I’m sure trying to find a plot for the film wasn’t easy considering the nature of the book and trying to make the film engaging for small children. I open the review proper with an Animaniacs clip that you might remember. It lampoons Bambi as well as portraying what I’m sure many parents experienced after taking their kids to see the sweet story of a lovable deer. Enjoy! The best word to describe Bambi is subdued; there’s a lot of subdued elements within the film. The opening credits are understated with simple fall imagery and green backgrounds. From there the film’s backgrounds are specifically softened so as to allow the animals the ability to stand out. As you saw with Dumbo the animators used watercolors and you really see those brushstrokes in the meadow scene. I’d place Bambi up with Snow White in terms of the beauty of the animation (that’s in my opinion of course). It’s well-documented that the animators studied the various species of woodland creatures in-depth for this film including bringing in deer and other animals into the Disney studios to study their behavior and habits. That’s not to say they were 100% accurate as deer have eyes on the side of their head and lack a chin so liberties had to be taken with Bambi’s facial features. Despite those liberties Bambi and his friends are expressive. The way Bambi looks in surprise at Faline for the first time and other tics make Bambi look human, allowing the audience to connect with him as more than just a deer. As with the animation of the backgrounds it’s evident the animators studied hard as the characters all move realistically. A great example is the way Bambi lies down by bending his front legs, leaning all the way down and then folding his back legs. It would have been easier for the animators to have Bambi flop on the ground like a human but that wouldn’t be realistic. The same with the owl whose head goes the complete 360 degrees! The film does an amazing job of placing the viewer into the world and making you see these characters as somewhat human. There’s a lovely POV shot of Bambi looking upside down at opossums (that he sees as right-side up). The way the camera changes position for it had to be advanced at the time. The other characters aren’t limited to being static, Thumper also has little facial tics that convey his emotion, his ears specifically that perk up or down depending on the emphasis of his words. I can understand now why people love Thumper, I’ve been missing that train. Voiced by then six-year-old Peter Behn, Thumper is the most human of the bunch. He’s a member of a large family (being a rabbit after all) and can’t seem to do anything without being scolded by his mother! I know his line “If you can’t say something nice” line is infamous but I love the second time his mother scolds him about eating his greens is hilarious. The simple way he says “about what” in response is so genuine. Behn’s vocal performance combined with the Thumper’s feet twirling and other ways to get out of trouble are so humanistic, exactly what a small-child would do. The other iconic character is that of Flower the misnamed skunk. One reason I needed to see the rest of the film sooner….to realize Flower is a boy! Please tell me I wasn’t the only one who was shocked when Flower is revealed as a boy, he sounds like a girl in the beginning (my apologies to Stan Alexander who was the voice of young Flower). Flower is probably given the least amount of screen time but he makes quite an impression being a skunk among the flowers. He’s darling and again, I wish I knew he was a boy before because the really make him besotted with Bambi in the beginning. I mean the way he giggles and gets embarrassed around Bambi would have worked better if Flower was a girl. I will admit I completely blocked out the traumatic aftermath of Bambi’s mother dying. I recall her being shot and, again, not being particularly concerned. 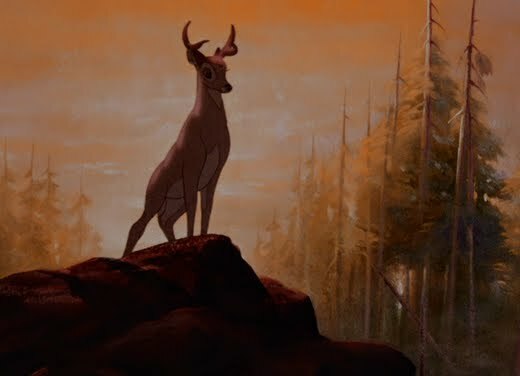 As an adult I still wasn’t shocked by her death (circle of life baby) but the way Bambi goes hunting for her and calling out for her is what got me. He can’t be shocked and upset by the manner of her death, he’s confused and frightened about being alone and not knowing what to do to survive. That is something that should resonate with anybody and what affected me the most. From there the film really seems to wrap up quickly, being only an hour and seven minutes. Once the group grows up there’s nothing adorable aside from them all falling in love rather quickly. Bambi goes away with his father and comes back to be reintroduced to everyone. 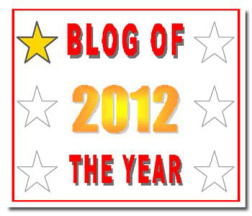 I felt that was repetitive and just filling up time. And while everyone’s crying about Bambi’s mom what about the actual death we do see that no one told me about, that of the bird who panics and flies out only to be shot! We actually see her body and combined with that moment of panic she experiences I found that to be far more unsettling than Bambi’s mom. I understand the connection we’re meant to have with Bambi and his mother but coldly killing a bird resonated. The forest fire is the climax of the film and by the end, after the forest has been burned mind you, the film ends with a happily ever after. It’s a tad confusing and the film never truly sews anything up as there’s no big plotline to do so. It’s shortened runtime doesn’t help but neither does the fact that the need for realism prevents the animals from doing anything outside their nature. If anything I’d consider Bambi a pre-cursor to the True Life Adventure documentaries of the 60 and 70s that Disney has revived recently. I’ll quickly mention songs here as there’s really no good place to put them. The characters themselves don’t sing but there are a few songs sung by an unseen choir. Their pretty and melodic but not memorable. I am glad I finally finished Bambi but I wouldn’t say I love it or like it that much. I love Thumper and the characters are children as there appears to be something to watch. 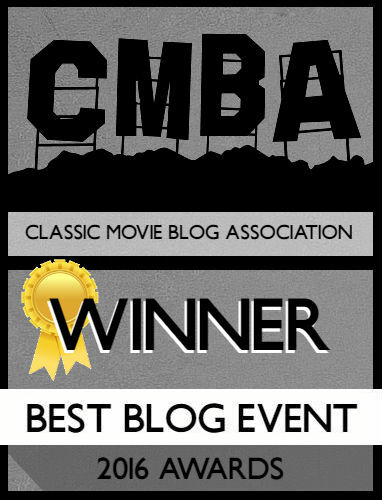 Once Bambi’s mother dies and the film abruptly jumps in time there’s no momentum. I recommend it to Disney completists or those who love gorgeous animation. NEXT TIME: The Adventures of Ichabod and Mr. Toad gets front of the line access on October 13th as part of the 31 Days of Halloween! Journeys in the Disney Vault returns, in order, November 3rd with Saludos Amigos! My recollection of Bambi was not really liking it but my rewatch moved it safely into the top 10 of Disney for me. There’s a lot of interesting subtext, lots of Freudian oedipal complex type things and the like. Just found it more fascinating than I expected. BTW, my own Disney marathon left off at Alice in Wonderland…I might have to take it back up when you get there. Ooh I didn’t think of any subtext, mainly because I just felt the story didn’t have much meat to it. Hope you get back to the Disney marathon, I’ll be reading once you do! Bambi bored the brains out of me. But I have friends who would kill me for saying that. Good review. Oddly enough most of my friends who love it haven’t seen it in ages, wonder if that’s saying something. I wasn’t bored like I was with Fantasia but that was due to how short this was. Your not the only one! I never saw Bambi or any of the Disney films as a kid. This was the days before VCRs and my family didn’t have the money to go to the movies. I’ve since seen some of them as an adult and Bambi is one of them. I remember understanding why the scene with Bambi’s mom would bother kids, but I felt it probably bothered parents more because of their worry about how their kids would take it. I could definitely see it as a moment where parents don’t want to have a lengthy discussion about death at a young age. I shudder to think how Disney’s original ending (of Bambi finding his mother in a pool of blood…no joke) would have played with children. Bambi’s one of my favorites. I like how there really is no story, it’s just the life of a deer. It deals with the whole “circle of life” theme much better than its overrated successor The Lion King in my opinion. It’s one of DIsney’s more somber and adult films. True, but Lion King is bright with fun songs!